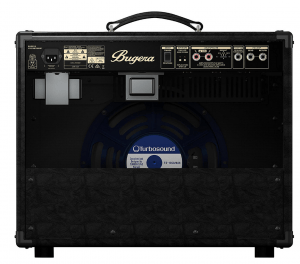 Ever since Behringer founded Bugera amps, guitarists have been cautiously optimistic. For once, we had a player on the market who promised to deliver affordable tube amps. In a world where ‘affordable’ and ‘tube amps’ don’t go together often, this announcement was bound to cause some ripples. However, the reality wasn’t all that shiny and sweet. Behringer itself had a spotty track record when it comes to building quality. I remember owning the BX4500H and having the dumbest problem with it, which nuked the whole thing. It wasn’t some crucial piece of electronics that died. No, it was the plastic jack ring, which snapped thus short-circuiting the input. That wouldn’t be such a big problem if you could find the replacement ring, however out of all the spare parts, that one just didn’t exist. That’s the type of reputation that plagued Behringer for years. However, they have learned from their mistakes, listened to their consumers and put together a combo amp that I’m pretty excited about. 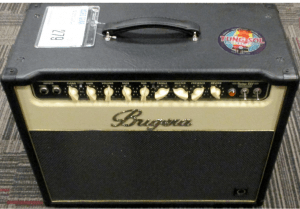 When the Bugera V22 first came out, it was one of the only all-tube amps in this price point.
. As expected, many took the gamble and snatched one of these amps. With first feedback coming in, things were looking pretty good for Bugera. The amp worked, there were very few quality control issues, and the tone was more than decent. It took a while for the community to accept this brand and the V22 Infinium combo as a viable alternative to much more expensive tube amps. We received a great little unit which gets you your money’s worth, but not much more than that. Is this bad? No, far from it. It’s a fantastic value and a great investment in your overall audio quality. With this beautiful tube amplifier, guitarists working with a limited budget have a very competitive alternative. Let’s pull this thing apart, see what makes it tick, and talk about the performance you can expect. Bugera markets these as ’boutique style’ guitar amplifiers. This label has nothing to do with the sound of the amp, but rather it’s vintage design. We’re looking at a decently large combo, which features a single 12″ speaker made by Turbosound (a British manufacturer). The whole thing is powered by three 12AX7 tubes as preamp tubes and two EL84s for the power amp stage. So far, so good. After all, this combination is more or less the standard these days, and is a configuration that has been used for a few decades. This is an Infinium model, so it watches the circuitry of the tube and modulates the power to prevent surges that would burn out the tube or drops that can damage them. As a result, these tubes last about 20 times longer than the tubes in your Grandfather’s amplifier would have lasted. Combined, all of the valves are capable of pushing out 22 Watts of power, which places this particular unit somewhere in the mid range. For a combo, that’s not bad at all. Looking at the control cluster, there’s a lot to work with. You have two inputs. There is a normal input and a bright input. These are separate inputs, so you would plug and unplug to go between them. The amplifier comes with two channels – a clean channel and a dirty one. Switching between the two is done either by pressing the small button on the control panel or by using the footswitch that comes with the amp. The presence control provides a mid boost comes in handy for delivering that extra punch. Frankly, I love the presence control so much that I’m inclined to leave it on anytime I’m playing on the dirty channel. I also turn the gain stage up pretty much all of the way. The presence control is what takes this amplifier from a so-so choice to a hands-down excellent option, even if you are playing lead and need to make your mark. For controls, you’re looking at your standard Clean, Gain, Volume along with the three-band EQ of bass, mid and treble. These provide a moderate amount of control, but lack the finesse of a true equalizer. Up next, we have the Master volume knob, Presence and finally Reverb. The reverb can also be controlled through the footswitch, giving you that little bit of sustain that you might want to toggle on and off. One more great feature is the pentode/triode mode switch, making the V22 a great practice amp as well. This lets you switch between 15 watts and 7.5 watts which expands the flexibility of this amp for different room sizes. There is also an impedance switch on the back that lets you connect to a 4, 8 or 16 ohm speaker for when you are gigging with others (the built-in speaker is an 8 ohm impedance). For comparison the VOX AC15 amp is one of the biggest competitors. This 22w amp answers the call, offers more control of your sound and excellent headroom for adding in an effects loop. I would argue that it even outperforms the AC15 by delivering a classic Fender rock sound without compromising the clean, clear chime tones. From what we talked about so far, this Infinium looks pretty decent.However, when we reach build quality, there’s a lot to discuss. Bugera claims that V22 Infinium combos are hand made. Whether this is true or not is up for debate. All I know is in my experience handmade amps are usually built like tanks, with hand soldered components ensuring that uncompromising signal integrity. That’s not really what I’ve seen on Bugera V22. To me, this looks just like another serial production combo made in Asia. Will it fall apart on you? I doubt it, but I had to clear that little detail up. The tubes inside the amp are decent, but swapping them out for branded units will boost the overall performance of the amp significantly. One thing that caught me by surprise is the quality of the speaker. That thing is just beautiful. Replacing it with something such as a Celestion, or similar degrades the sound quality – something I did not expect. The cab itself is solid but heavy. This has got to be one of the heavier combos out there, especially considering the power we’re talking about. One of the explanations for the extra weight can be found in the fact that Bugera used the good ole particle board. This type of wood is heavy on its own, which is only made worse when you add the rest of the components. Why is weight so important, you might ask? Well, considering that many wanted to use the V22 for gigging, having to deal with this type of weight could prove to be difficult on regular basis. Enough with the cosmetics, let’s talk performance. As I’ve mentioned above, you get a clean and dirty channel to play with. Clean sounds really good. The tone is clear, crispy and has that punchy vibe to it. Both single coils and humbuckers sound great. There’s that certain organic flavor to it, which is reminiscent of the vintage tubes. Tone shaping using the existing controls is a bit rustic, but you can be pretty precise if you spend enough time dialing in what you want. Once you switch to the dirty channel, you are greeted by a rather greasy overdrive. The Dirty channel is a little under powered. But once you turn the gain up on your guitar and dial up the presence control, it sounds like a lot more amp than it is. I like this type of overdrive, but not everyone will. 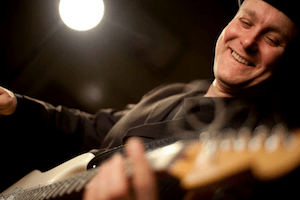 When you attenuate the amp, you can push those tubes into that sweet spot. V22 doesn’t fail to deliver in this regard, either. You can extract a lot of crunches, that’s for sure. Even though it has digital reverb it feels authentic enough for stage use. Some folks have complained that this amp is a tad to bright and they are running the Treble knob at around a 4. Something fun you can try is to swap out the EL84’s for a a set of NOS Soviet 6P14P tubes. They’re compatible and the curve is very similar but they dampen those highs just a little. Some of you are wondering if 15 watts will be loud enough to play with a band. You need to understand that these that these valve tubes run at lower watts. This generation has gotten used to buying 100 watt solid state amps. The 15 Watt tube amps are going to work well for playing in a band. If you need more volume (congrats on playing larger gigs! ), you can use the auxillary output to connect it to a larger amp. This setup lets you use the V22 as your amp head, while investing in an affordable external speaker cabinet. Personally, I see the 22W Infinium combo amp as a great bang for the buck deal. You get what you pay for, but there’s a lot of room for upgrades should you wish so. This amp gives you a very solid foundation, with a speaker that took me, and many others by surprise. I’d say it’s an excellent choice for a gig unit if you don’t mind the weight. The tone is definitely worth the extra effort. Some will say that the build quality is bad. I don’t agree. While it’s not a ’boutique style’ unit regarding craftsmanship, I don’t see it as any better or worse than your average mid-range combo. All you have to do is treat it as such, and you should have problems with it. The tubes are Chinese made, low-quality units, but crafted to produce the same wavelength of some of the earliest tube amps ever made. While I understand the need to keep the costs down to market the amp at its current price, I think you might want to play around with different tube configurations. At the end of the day, V22 Infinium is a perfect choice for someone who plays blues or classic rock, and gigs from time to time. You can even push into that punk rock range, but it’s not going to be enough for metal. A lot of Strat, Les Pauls and Tele owners are loving the sounds they get out of this tube combo. If you are getting it for the dirty tones, it could use an overdrive pedal. It is almost there, but an overdrive pedal delivers that little extra grit you need to truly shred. The amplifier has all the qualities to support this type of use, while I would even put into a jazz environment. The stereotypes about Behringer fall short with this combo. Sure, there was a period when Bugera suffered from some quality control issues, but those days are long gone. 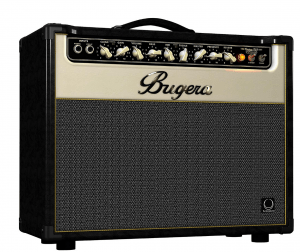 Whether you are a looking for an affordable gig amp, or a beginner hell bent on getting your first tube amp in the bedroom, Bugera V22 Infinium is a viable choice. It is also an excellent amp for using with with effects loop. It has enough head room to plug in your pedal board and start experimenting. As long as you understand exactly what this model was designed to do, and what it offers, you shouldn’t be disappointed. After you get to know it and what type of tone it is capable of delivering, replacing the tubes might be the next logical step. The increase in sound quality is too obvious not to do so. This one brings the sound you need for playing at home, the ruggedness to gig with you around town, and the features you need to expand your playing as you grow as an artist. Even as someone who was burnt by Behringer before, this combo has convinced me that the brand is one of the best. And even I would gladly invest in one of these units. > Go Here To Check Price On The Infinium At Amazon!